(Step) Mother’s Day | Oh My Tiny Little Pea Head! Sunday was Mother’s Day. My Mother-In-Law lives in sunny California and my Mom was en route from Florida to New Hampshire, so we didn’t have much going on. Everyone else was either celebrating with their mothers or being celebrated as a mother. I am a step-mother, twice actually. I have two step-daughters from my first marriage who are in their mid-twenties now and live in NYC. Plus, Greg has a son who just finished his sophomore year at URI. All really good kids and I love them to death. But being a step-mother is hard. Especially, when you are the kind that is married to the non-custodial parent. You don’t live with them, you don’t help raise them on a daily basis, and you suddenly entered their lives some point along the way. It can feel like jumping on a speeding train. I don’t try to be their mother; they have mothers, good mothers. I try to be caring, objective, an excellent listener, and a good friend. With limited actual authority, I offer suggestions and strive to set a good example. It seems to work for us. 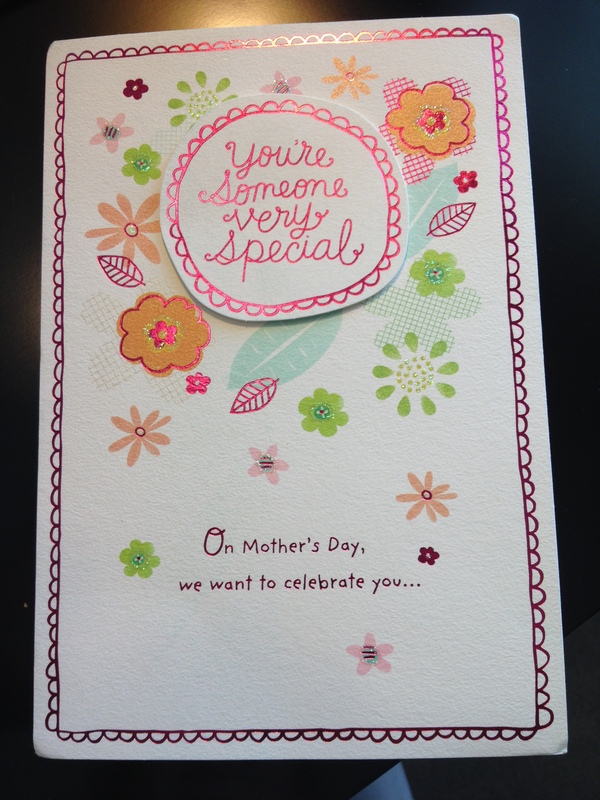 But, it does make Mother’s Day hard (and quiet), because I am not a mother. This year I was feeling particularly left out. Maybe because thanks to all the chemo they pumped through my body, I am now officially post-menopausal. Although, I came to terms with not having my own children years ago, it just feels more final. Anyways, my hubs is a good man, a really good man (see my post Chemo Buddy), and he sensed I needed a little love. So, it was a beautiful day and he took me to Boston. We had lunch and drinks outside in the Seaport District. It was a fun little excursion, but the best part was it said “I love and appreciate you.” A perfect (Step) Mother’s Day, just what I needed. Then yesterday, this arrived and put another smile on my face! The girls have matured into two beautiful, smart, caring little ladies and I am proud to be part of their lives. So, no need to feel sorry for myself. I may not have the most conventional family situation, but the important thing is they are all my family and I am lucky to have them whether I see them or not. 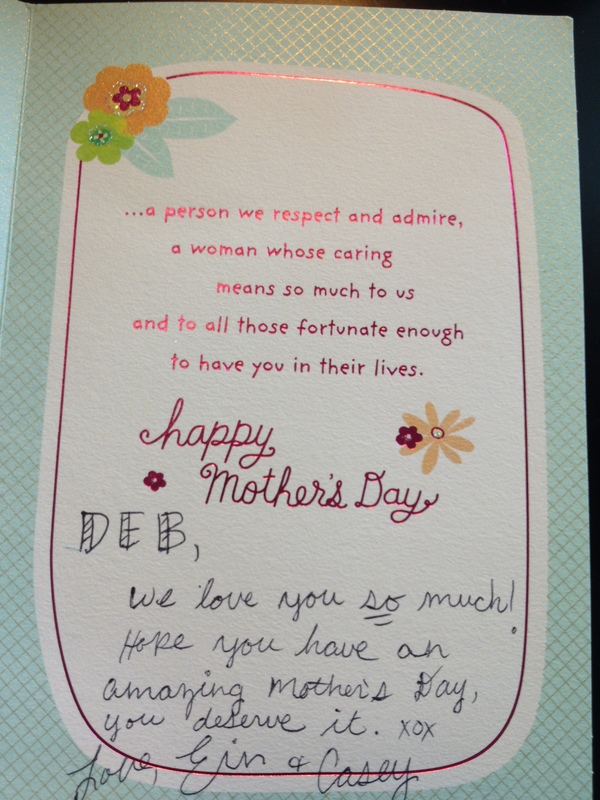 So I just started to cry at work when reading this…You are very special and all those around you…love you! Happy Mother’s day Deb!